Caption slip reads: "Photographer: Brunk. Date: 1957-10-11. Reporter: Donoghue. Assignment: Miss Latin America. Special instructions: Daily. 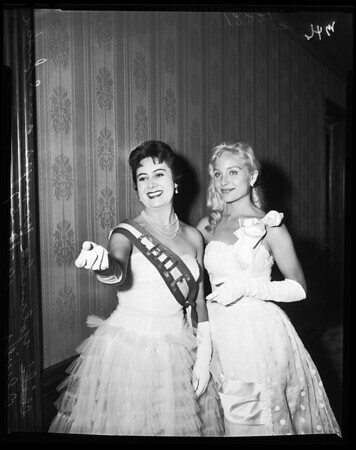 45 & 46: L to R -- Miss Chili (Yolanda Wemyss, top runner for Miss Latin America) and Susan Oliver, New York City, Warner Bros. star, selected to crown winner of Miss Latin America Beauty Contest at Annual Colombus Day Ball sponsored by Latin American Consular Association at Ambassador (last) Friday night".